The celebration, Friday, June 23, 2017, 6:00 pm, includes a Soul Food Dinner and musical entertainment. Proceeds will benefit Garrison School Cultural Center and its work to preserve history, celebrate culture, and promote human relations. President Abraham Lincoln signed on January 1, 1863 the Emancipation Proclamation that freed enslaved African Americans, but persons enslaved in Missouri did not learn of their freedom until January 11, 1865, and persons in Texas until June 19, 1865. Juneteenth celebrations began in Texas where it is an official holiday, but it is only one of a number of freedom day celebrations held on various dates commemorating the end of slavery across the country. include a Soul Food Dinner and musical entertainment. preserve history, celebrate culture, and promote human relations. Click here to purchase tickets by mail. 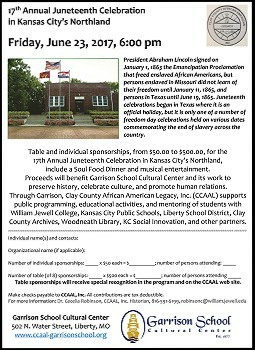 Through Garrison, Clay County African American Legacy, Inc. (CCAAL) supports public programming, educational activities, and mentoring of students with William Jewell College, Kansas City Public Schools, Liberty School District, Clay County Archives, Woodneath Library, KC Social Innovation, and other partners.